Apple's new Music app brings streaming playlists to your watch. Your Apple Watch just became an even better workout accessory with the release of Apple Music, which brings streaming playlists right to your wrist. Apple Watch has 2GB of local music storage so you could always sync albums or playlists of songs you had purchased from iTunes to the watch for offline listening. But before the new Music app rolled out with iOS 8.4 on June 30, you couldn’t sync your streaming playlists to the watch. Now you can. This gives Apple Music an advantage over competing streaming services like Spotify and Rdio with Apple Watch owners, because your playlists on those services can’t be streamed without your iPhone in Bluetooth range. You can build Apple Music playlists from iTunes purchases and streaming, and you can listen to all of those songs without a phone nearby. Sync streaming playlists to your Apple Watch with Apple Music. First, build some playlists in the new Music app by tapping over to My Music > Playlists > New. Your playlist needs a name, of course, then you can add songs to it by searching for songs or whole albums. If you already have playlists ready to go, you can easily add or delete songs. You can also add playlists that Apple Music’s curators have created—I like the pre-built workout soundtracks—but you have to add them to playlists you’ve made, otherwise they won’t show up in the iPhone Watch app’s Music section. Go to My Music > Playlists > New > Add Music, and then type in the name of the playlist you want to add to your own and add it to an existing one—I added "Trappin' on the Treadmill" to my Running mix with some other high-tempo jams. Playlists done? Now open the Apple Watch app on your iPhone and tap through My Watch > Music > Synced Playlist, where you’ll see a list of the playlists you’ve created in the Apple Music app. Now tap to select the ones you want to sync to your watch—and make sure the watch is on its charging cradle, otherwise nothing will happen. 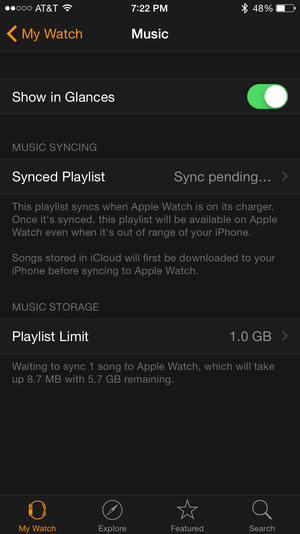 In the Music section, right below Synced Playlist, is an option to increase the amount of storage allotted to playlists on your watch. You can have up to 2GB of songs stored on the watch, which is plenty for a great workout playlist. Once your playlist is finished syncing, you’ll need to pair Bluetooth headphones to the watch to listen to your playlist directly from the device. 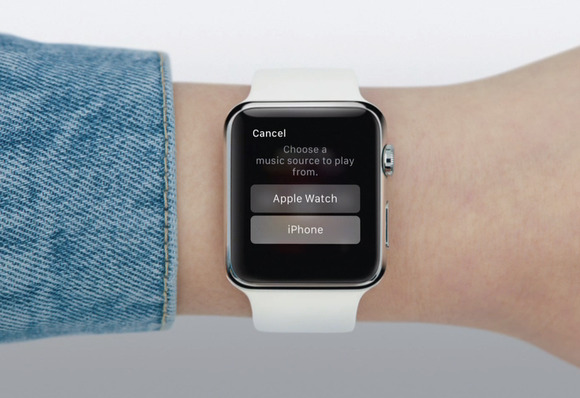 Then open the Music app on your watch home screen and use Force Touch to change the music source from your iPhone to your watch. Select your playlist, and off you go—you can even leave your phone behind if you want to work out completely unencumbered.